The study of materials used in nuclear power plants is rendered difficult due to the high radioactivity of even a few gram samples. Whereas it would require lots of systematic experiments in large facilities like synchrotrons in order to understand their behavior, safety requirements have restricted the study of spent nuclear fuel with synchrotron to only a few cases. In our study, we have explored an alternative to the synchrotron, i.e. a table-top version of an X-ray absorption spectrometer device. This new equipment would allow systematic and extensive studies, especially of highly radioactive nuclear materials such as nuclear spent fuel. 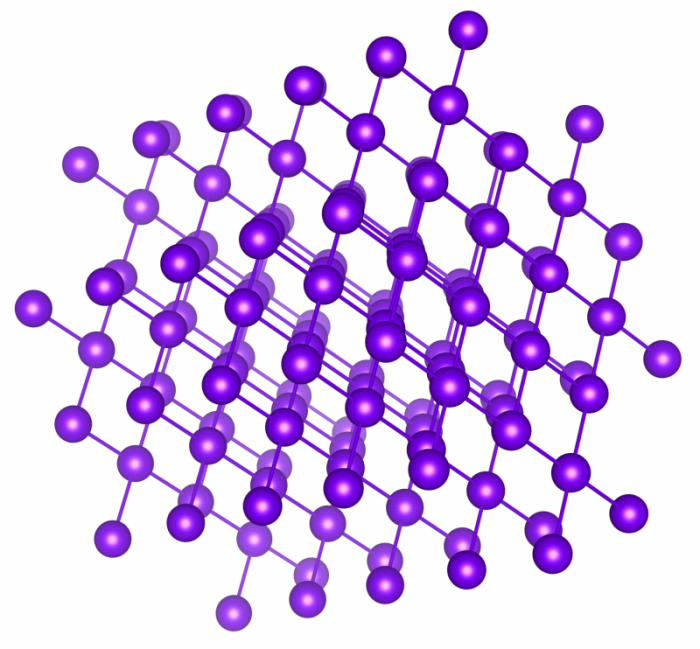 The way materials behave is often related to their properties and phenomena at the atomic scale. Probing the atomic properties and their evolution as a function of an external factor — for example, temperature, pressure, or the composition of air — can help researchers to understand and predict the material behavior at a larger scale. The study of complex materials becomes, however, increasingly difficult because it requires a large number of experiments in order to extract a specific effect. For example, when studying a material composed of a large number of different atomic species, it is difficult to discern whether observed phenomena are caused by the influence of the external factor applied during the study or by the interactions of the components within the material. Put differently, two similar materials — that would be composed of the same atomic species except one — could react to the very same external factor in a completely different way. In the case of nuclear fuel, there are dozens of different atomic species coexisting with uranium when it is taken out of a reactor. Indeed, one fission reaction produces two new atoms, called fission products, which are not always the exact same two. Fission is a random process that gives rise to many different couples of fission products. The main constraint here is that the sum of the numbers of proton of both fissions products is always exactly one of the fissioning atoms. 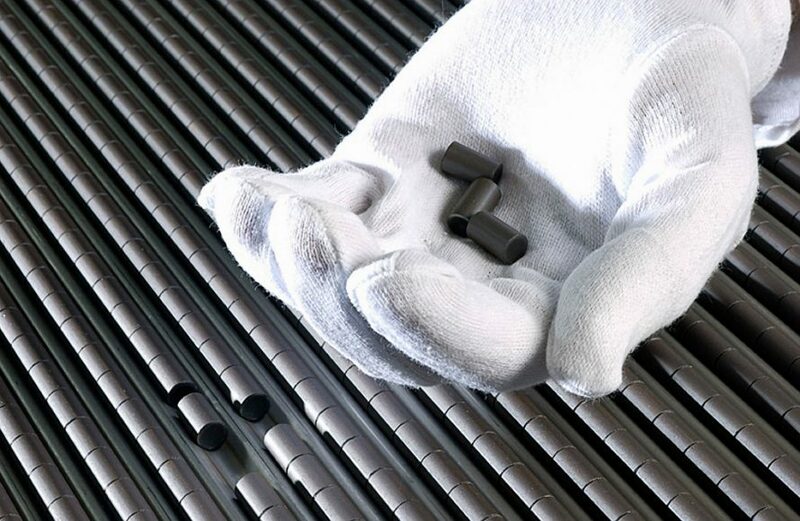 Knowing now the complexity of the composition of nuclear fuel, one can easily figure out how difficult it is to accurately understand the behavior of the material. Because it is also radioactive, the composition constantly evolves over a very long period of time (centuries) which furthermore leads to the difficulty of efficiently predicting the material behavior. Finally, considering the potentially terrible consequences of nuclear accidents, it explains the large safety margins taken into account by most countries when considering nuclear energy. To fully understand what happens at the atomic scale in nuclear fuel would be of great scientific and public interest — especially since spent fuel will be buried in deep geological formations. In our recent study, we show that the use of X-ray absorption at synchrotron facilities can highlight the effect of other elements than uranium has on the properties of spent nuclear fuel. The concept of X-ray absorption spectroscopy (XAS) is to probe a material with well-focused, mono-energetic but tunable X-ray beams. The probability of a specific atom to absorb X-rays is linked to the nature, number, and geometrical arrangement of the surrounding atoms. In a synchrotron, X-rays are produced when ultra-fast electrons are accelerated in a curved path — the reason why they are often housed in large, circular, torus-shaped buildings — which results in a focused and highly intense X-ray emission with a wide energy range. The X-rays are then selected according to their energy with a combination of mirrors and crystal analyzers. Mirrors are used to direct the emission beam onto the material to study while crystal analyzers use diffraction to select only one specific energy, sacrificing a large intensity loss. Diffraction is a phenomenon that occurs at the atomic scale in a crystalline material — a solid material in which atoms are highly ordered and form a geometrically regular lattice that extends in all directions. Favored directions and planes can, therefore, be defined in crystalline materials that will be characteristic of each material (see figure below). Diffraction, then, is an optical process during which only photons of a specific energy (usually in the domain of X-ray energy) will be diffused by atoms of given atomic planes. The photons of different energy are else being absorbed in the material. The diffracted photon energy is then a function of the inter-planar distances and the incident angle of the photon beam on the crystal. By carefully choosing the crystal, its orientation (which planes of the crystal are used), and the incident angle, a mono-energetic (or monochromatic) beam can then be selected from an X-ray source. Many studies on spent nuclear fuel have demonstrated that XAS is very efficient in determining how the electrons of atoms behave in nuclear fuel. XAS is also very well suited to extracting information about the surrounding atoms: their nature, number, or distances between atoms. These properties also evolve in the fuel as a function of its composition, i.e. according to the relative concentration of fission products. Since there is no straightforward way to evaluate the cross-influence of different fission products, it is mandatory to study each of them individually, at least the most abundant ones. To perform such a huge number of experiments at a synchrotron facility would require an instrument entirely dedicated to this purpose. Even then, transporting samples of spent fuel to this facility from a storage place would still be difficult and expensive due to the safety issues involved in handling such a material. Transporting even few grams of the highest radioactive spent nuclear fuel can cost up to a million euros. A more attractive solution would, therefore, be to bring the synchrotron itself to the materials. Laboratory-based devices for studying the fine structure of metals and other simple compounds were widely used in the early stages of developing X-ray absorption techniques in the 1960s. But the rise of synchrotron in the 1970s together with the limitations of available X-ray sources have — apart from a few specific exceptions — held back the use of table-top XAS devices until recent years. In 2014, a group of researchers from the University of Washington started a research program [Seidler 2014] aiming at developing a new generation of XAS instruments that would be inexpensive, small, and able to perform certain routine experiments without compromising result quality too much. As stated earlier, a large proportion of the photons are lost in the monochromation process. Losing such a large quantity of photons is not an issue in a synchrotron — because of the huge quantity of photons produced. Major concerns arise, however, when using a commercial X-ray source, which can produce only a millionth of the number of photons that a synchrotron produces. Those X-rays are also not focused at all, meaning that they are emitted in almost all directions, which even further reduces the amount of usable X-rays. The challenge was hence to get a mono-energetic X-ray beam out of a commercial X-ray source while ensuring a high enough intensity on the sample. This was achieved thanks to a spherically bent crystal analyzer (SBCA) that uses diffraction to select only one specific energy, while the spherical bending focuses the X-rays in one point, like a magnifying glass (figure below). 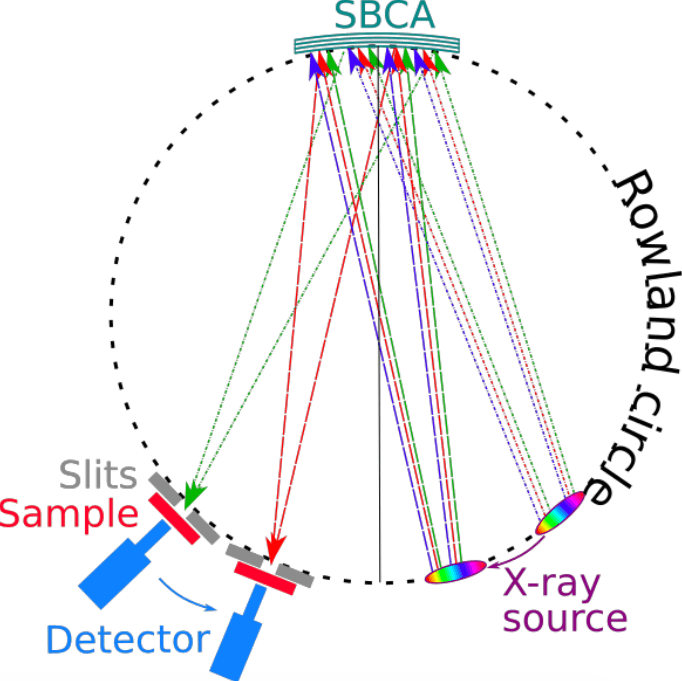 Through the genuine combination of a spherically bent crystal analyzer and other modern equipment, the University of Washington team demonstrated that it is possible to obtain synchrotron quality results using a laboratory-based XAS device. With this new device, they have studied metallic materials relevant for catalytic or electrical energy storage systems using X-ray energy ranging between 5-10 keV — the photon energy for which the X-ray source emits the maximum intensity (highest number of photons). Convinced that these new developments could also benefit the study of nuclear fuel materials, we have measured uranium-based compounds similar to unused nuclear fuel with a laboratory XAS setup, through a joint study between Aalto University and the University of Helsinki. We have successfully obtained results of the same precision and quality that can be achieved with a synchrotron light source. We conducted experiments on the same batch of three samples to show the efficiency of laboratory-based XAS in reproducing the results obtained with a synchrotron. The samples were chosen to present the different structural and chemical states that uranium atoms can have when used in a reactor. These samples are usually used as references because they have a unique and stable chemical structure. We now have shown, with our colleagues from the University of Helsinki, that a laboratory-based instrument can successfully distinguish these three different structures. This means that the energy resolution of the instrument is high enough for separating fine structures that differ only of few eV. Considering that the incoming X-ray energy is about 10-20 keV, the device achieved a resolution of approximately 1‱ precision. Moreover, the laboratory-scale results perfectly match the ones acquired at a synchrotron facility. A further achievement in the experiments is the ability to collect XAS data in a reasonable amount of time, although the number of photons produced by a commercial X-ray source is much lower at 17 keV than at the 5-10 keV energy-range used in the previous study by Seidler. One sample needs approximately 24h to be measured using a laboratory device, while at a synchrotron it takes less than an hour. However, in a laboratory environment, beamtime is not a bottleneck issue, so the achievement shows great promise! The foremost breakthrough here is, of course, to be able to perform experiments in the lab where the materials to be studied are produced or stored. From the point of view of nuclear materials, it means that researchers could now perform systematic studies on many samples at every production stage and investigate the effects of high radioactivity onto the material itself. Table-top XAS equipment will also allow investigation of the highly radioactive matter that for safety reasons cannot be transported to a synchrotron nowadays. The availability of these devices would no more put limits to time used in experiments. Researchers can thus follow the evolution of the materials’ behavior over time. We thus expect to see major outcomes in the next few years in the study of the atomic scale behavior of nuclear materials. These developments can open the door for significant safety improvements in the field of nuclear energy. The benefits of these new developments extend naturally beyond radioactive matter especially because table-top XAS devices can now also be implemented at an industrial scale. These findings are described in the article entitled Laboratory-scale X-ray absorption spectroscopy approach for actinide research: Experiment at the uranium L3-edge, recently published in the Journal of Nuclear Materials. This work was conducted by R. Bès from Aalto University, T. Ahopelto, A.-P. Honkanen, and S. Huotari from the University of Helsinki, G. Leinders and J. Pakarinen from the Belgian Nuclear Research Centre, and K. Kvashnina from Rossendorf Beamline at ESRF – The European Synchrotron and Helmholtz Zentrum Dresden-Rossendorf (HZDR). [Seidler 2014] G.T. Seidler, D.R. Mortensen, A.J. Remesnik, J.I. Pacold, N.A. Ball, N. Barry, M. Styczinski, O.R. Hoidn, Rev. Sci. Instrum. 85 (2014), 113906. A. Vancraeyenest works at the Laboratoire de Physique Subatomique et de Cosmologie de Grenoble. My research field consists in the characterization of current and advanced nuclear fuels to enhance the safety and efficiency of the nuclear energy resource. One important information I am interested in is the local structure behavior (lattice and defects) as a function of temperature and irradiation on virgin fuels including or not dopant and/or fission product. To this aim, I am using Positron Annihilation Spectroscopy (PAS) and synchrotron radiation related technique such as X-ray Absorption Spectroscopy (XAS) and the cutting-edge High Energy Resolution Fluorescence Detected X-ray Absorption Spectroscopy (HERFD-XAS) which combines X-ray absorption and emission. In addition to the experimental work, spectroscopy related calculations are also performed. Previous Post« Previous Low-Carbon Transitions: How Much Change Can A Nation Afford?